If you seek a smoothie for weight loss, this can possibly be your best choice. 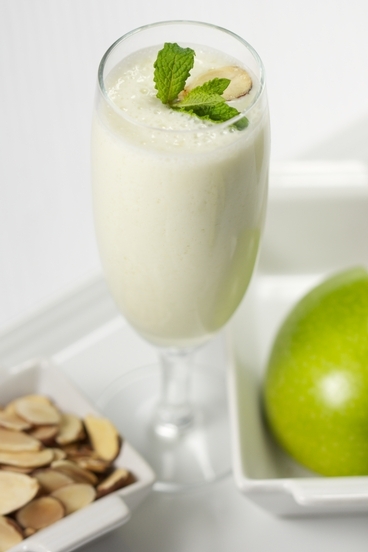 The apple-yogurt smoothie is one of the light, low calorie and nutritious smoothies you can take as a snack to fill up your stomach. The fiber content in apples works well with the Greek yogurt to make you feel full; then after your body gets benefit from the snack, you will stay energetic. The same smoothie can be introduced to toddlers as nutritious solid food. You can eat it as a healthy dessert, when made with fruit garnish and honey or syrup. - Unpeeled apple, or more if you prefer. - One cup of yogurt. You can increase the amount according to the number of apples and how you want the mix; more yogurt for non-sticky texture, and surely Greek yogurt for a more creamy texture. - 1/3 cup of milk or apple juice. You can mix both with honey for an extra rich taste. mix all ingredients in the blender then serve with fresh peppermint leaves or a dash of ground cinnamon. Tip: using single type of apples, like red or French green apples, will add more flavor to the mix, even with berries or bananas. For an alternative choice, use only Greek yogurt with natural apple juice. You will get an amazing yogurt smoothie, especially with fruit yogurt.